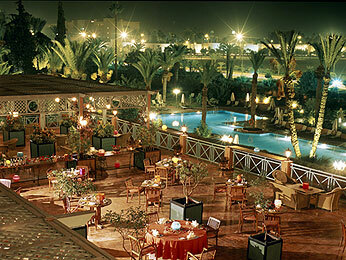 Sofitel Marrakech Lounge and Spa offers luxurious accommodation 800 metres from Jamaâ El Fna Square. It features a spa, 3 swimming pools and 3 restaurants and bars. The luxury guest rooms and suites at the Sofitel Marrakech offer a private balcony overlooking the mountains or gardens. All are contemporary in style with modern furnishings and some have a separate lounge. Gourmet, olive oil-inspired and ProShapeRX healthy spa dishes are served in the hotel’s several restaurants. L’Orangerie features a terrace overlooking the Atlas Mountains and Darkum bar serves international teas. Additional facilities include a fitness centre and for a supplement, a spa with an indoor pool, hammam and hot tub. The hotel also has Wi-Fi throughout and a 24-hour reception with a currency exchange service. The hotel’s valet service can park guests’ cars in the secure outdoor or indoor car park. Marrakech Menara Airport is a 10-minute drive away and Bahia Palace is 1 km from the hotel. About Us | Links | Contact us | Log in | Entries (RSS) | Comments (RSS) 55 queries. 0.660 seconds.